DATRON offers customized tool changing systems for each machining solution. According to the spindle type in use, there are tool changers available with direct shank clamping or HSK clamping cones. Due to our tool length sensor, the tool length can be automatically compensated. The DATRON tool magazine 12-fold enables an automatic pickup tool change and hold for up to 12 tools. The special holders on the tool carrier enable tools to be placed or picked up by the spindle. By combining two or three tool magazines, the capacity can be increased to up to 36 tools, depending on the machine type. This makes it possible to cover a wide range of applications without having to reload the magazine. 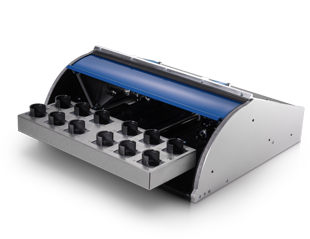 The tool carrier is located under an automatically opening and closing hood to protect the tools from a heavy accumulation of chips. In addition, air pressure nozzles minimize the accumulation of chips in functionally relevant areas. The DATRON precision probing head allows tool lengths to be measured quickly, precisely and automatically, as well as the tool check. The functional principle with linear guidance is absolutely free of transverse forces, so that even sensitive and very small tools can be measured. The sensor is suitable for the machine systems M8, M8Cube, M7, ML, MLCube and MV and M10.